It has been our pleasure to welcome you at Sofitel Mumbai BKC and we thank you for your loyalty and patronage. I am truly delighted that you were able to enjoy a generous service experience during your visit and that our ambassadors ensured you were well taken care of. We are humbled by your gracious compliments and are pleased to note just how special your stay was. Your feedback is most gratifying as it is our endeavour to ensure that our guests have memorable experiences each time they stay with us. We look forward to welcoming you back with us at Sofitel Mumbai BKC soon and thank you again for your patronage and recommendations to others. L’hotel a de tres bons points. Les équipes sont très gentilles et attentionnées. Cependant, certains éléments sont assez décevant de la part d’un Sofitel. Au niveau du buffet du petit déjeuner, j’ai connu des Sofitel avec un choix beaucoup plus varié et beaucoup plus attractif. De même, la salle de sport est sombre et avec une moquette, ce qui n’est pas très tentant. C’est dommage. Quand on paye le prix pour être au Sofitel, on espère avoir le service et la qualité allant avec. It has been our pleasure to welcome you at Sofitel Mumbai BKC and we thank you for sharing feedback about your recent visit. We are very pleased to know that you appreciated our competent employees and the service rendered to you during your stay. Additionally, in addressing your feedback on our breakfast buffet - we pride ourselves on the international buffet we have on offer for our guests comprising of English, French, European as well as an array of Indian items. You may be interested to know that 50-55% of our guests are westerners and are satisfied with the huge variety. Being a French hotel, we have a lot of emphasis given on our French food ranging from the traditional European morning bakeries to imported European cheese as well as charcuteries, eggs to order, cereals, fruits and a selection of fresh juices – the variety is endless. Do write to us directly regarding any preferences you may personally have. Our Executive Chef will be happy to look into the same. I have also shared your comment regarding the gym facility with our Accor design and technical teams and rest assured your feedback will be reviewed by them for upcoming and future projects. We hope you will give us the opportunity of welcoming you again in Sofitel Mumbai BKC and convert your good experiences to best to earn that desired 5th star. 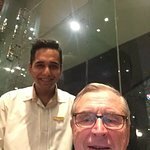 Try to be served by VARUN when you go the restaurant: he recommends delicious plates,help to select the corresponding beverages and let you find out Indian specialties you would not find alone . Thank you so much for your warm endorsements of Sofitel Mumbai BKC. Your generous praise is much appreciated and we hope to deliver more such experiences for you on your future visits to our property. I am pleased to note that you appreciated Varun's recommendation of culinary offerings in Pondichéry Café and that he assisted you well during your dining experience there. He has been specially recognized for this and I thank you for highlighting the same. Life is indeed Magnifique in Mumbai when you are at the Sofitel Mumbai BKC and we cannot wait to welcome you back very soon to our property. Nous avons passé un très mémorable réveillon de la St Sylvestre dans une délicate ambiance de musique indienne soft et un dîner délicat sur le thème des maharajas. Les mets étaient délicats et raffinés et le service à la perfection sous le regard attentif du maître d'hôtel Rohit ! Your kind commendations of our property and services just brightened our day. We strive to deliver the best experiences whenever possible and it was a pleasure for us to be at your service. I thank you for your kind recommendation and hope that Sofitel Mumbai BKC continues to remain your preferred hotel on all your future visits to Mumbai.